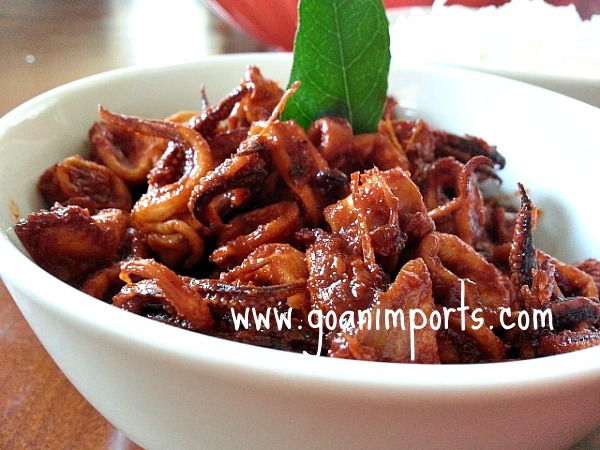 If you love calamari and Indian spices, then you will love this easy Goan food recipe called as Squid Recheado Fry. 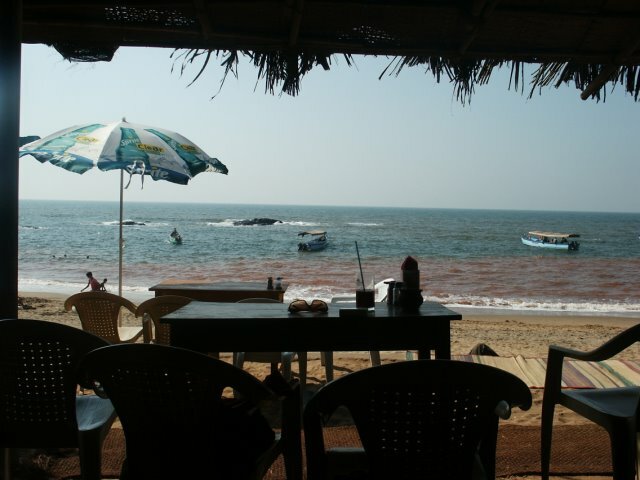 In Goa, calamari is called Squids in English, Mankios in Konkani and Lulas in Portuguese. This recipe can also be done as a stuffed calamari using the tentacle and shrimps first cooked in the spices along with sauted onions,then stuffed in the calamari and shallow fried. That is how my mom would cook it as well. 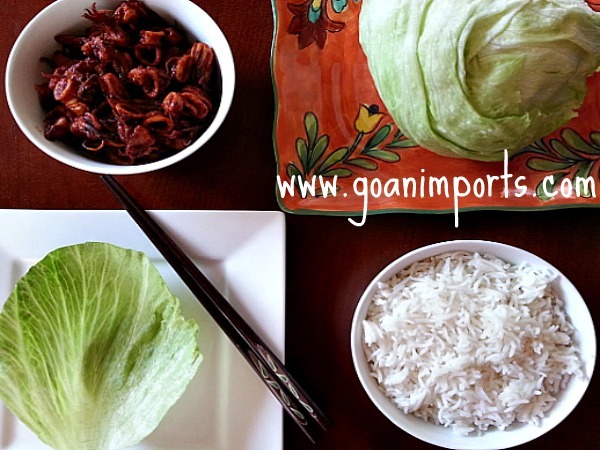 This popular Goan recipe works as a great side or as an appetizer and this is where in Goa you should be enjoying it with a nice cold beer on a “Beach Shacks” . It will also be a dish to remember. * Apply salt and 1 tbsp of recheado masala and marinate the calamari or squids for 15-20 minutes. * Heat oil on medium and add the marinated calamari and saute for 1 1/2 minute. Drain out the water and separate the calamari in a plate. 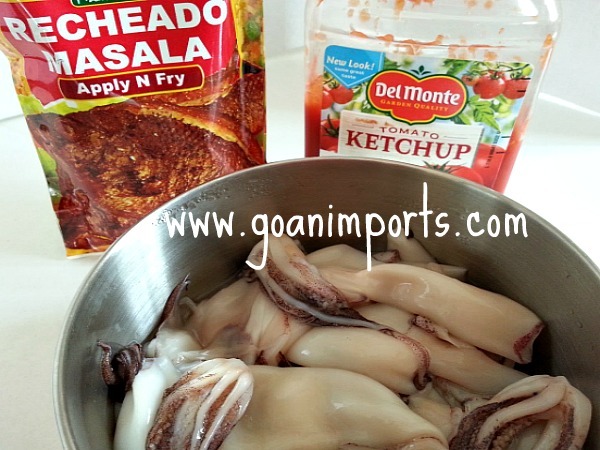 *To the same hot pan add the remaining 2 tbsp of the recheado goan masala and ketchup and saute for about 1-2 minutes add the calamari back again and saute for another 1 1/2 minute till its done . Please note in order for the calamari to be soft it takes only about 3 minutes to cook them or else it gets rubbery. If it does then the best way to soften it is to cook it for 20-25 minutes more. This dish was a bit of a trick since it is tough to get it cooked in such a short time. If you like to cook it with gravy then don’t discard the water and you can use it as a nice spicy calamari sauce for pasta or rice by cooking for another 20 minutes covered and the sauce is thicken. Garnish it with parsley or cilantro which ever is your preference. This looks a most interesting variation on the way I cook squid. Have a look at my post of February 2015 ” Calamars à l’Armoricaine” and tell me what you think. Meanwhile, I’ll try your recipe. This looks amazing! I am going to try to make it!